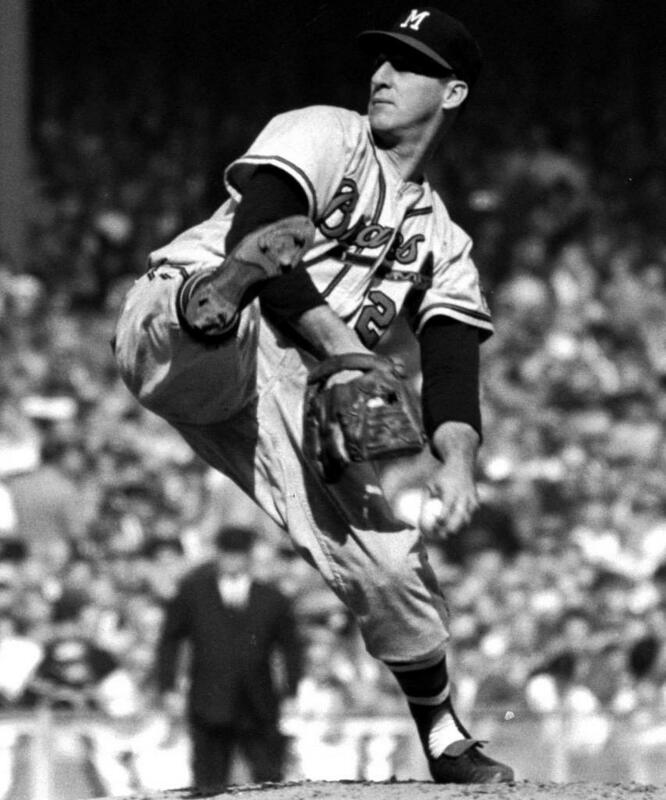 Warren Spahn’s 363 wins are the most by a left-hander in baseball history. The total also tops every pitcher in the post-1920 live-ball era. 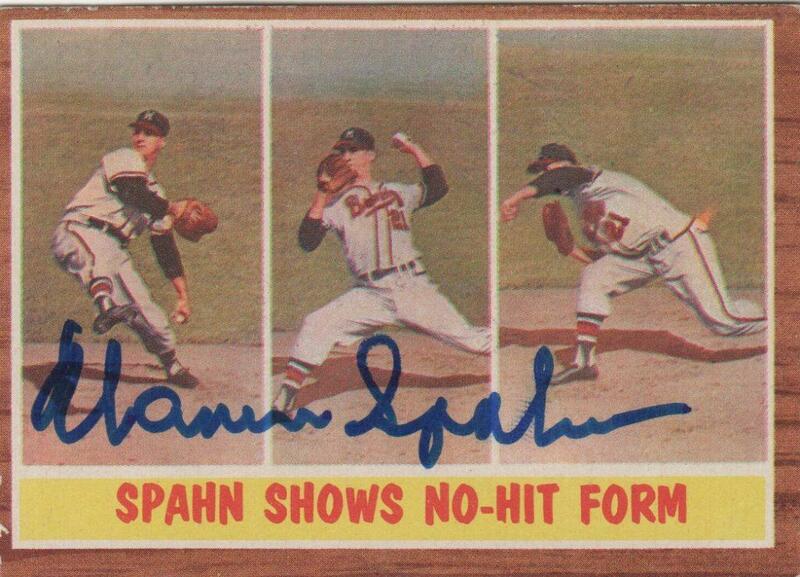 “Spahn shows no-hit form,” proclaims this offering from 1962. Spahn won 20 or more games 13 times over the course of his 21-year career. His 363 wins are more than any other left-handed pitcher in history, and more than any other pitcher who played his entire career in the post-1920 live-ball era. 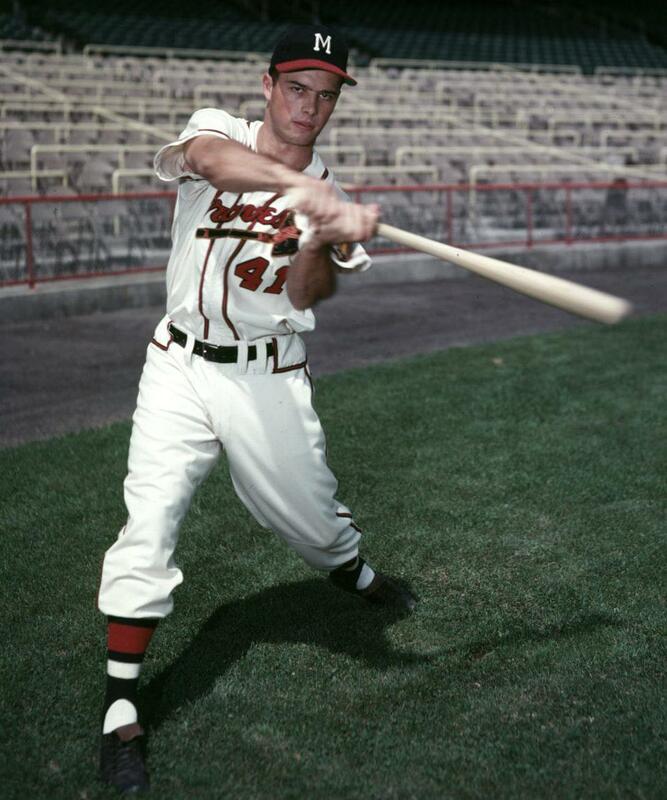 Spahn threw his first no-hitter against the Phillies 16 September 1960, when he was 39. 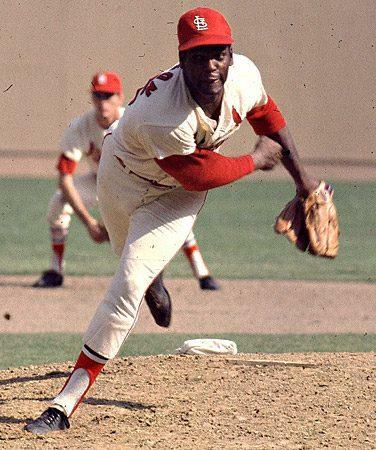 He pitched his second no-hitter the following year, 28 April 1961, against the Giants. 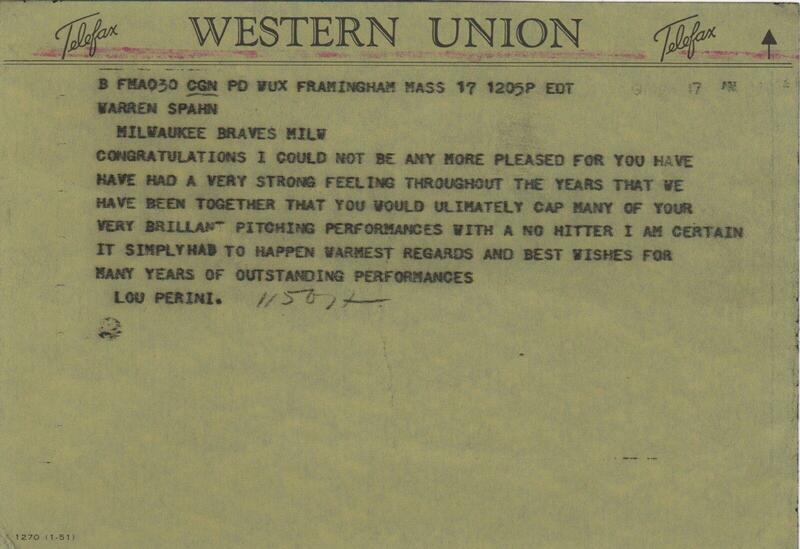 After throwing his first no-hitter Spahn received this telegram from Lou Perini, the principal owner of the Braves from 1945-1961. 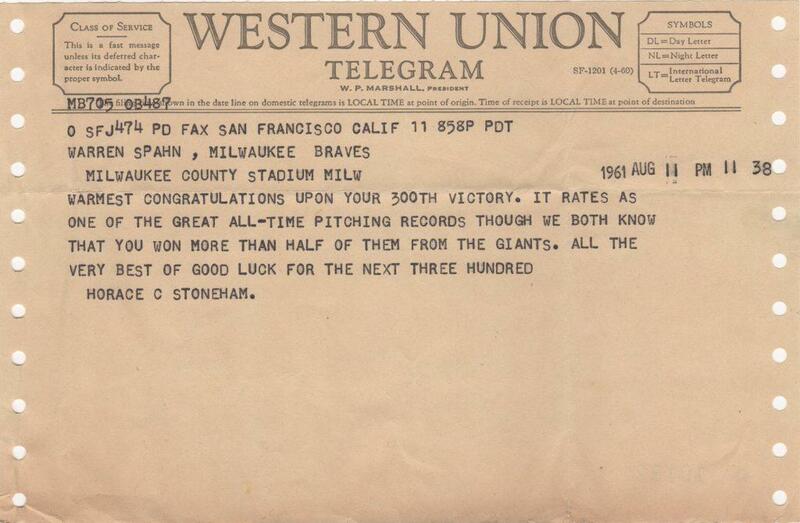 The telegram reads in part, “…have had a very strong feeling throughout the years that we have been together that you would ultimately cap many of your brilliant pitching performances with a no-hitter…” Spahn kept the telegram from the team owner for his entire life. The 1957 Cy Young Award winner, Warren Spahn also finished second in voting three times — all during years in which only one award was given for all of baseball. with 363 career wins, Spahn has the most MLB wins by any left-handed pitcher. 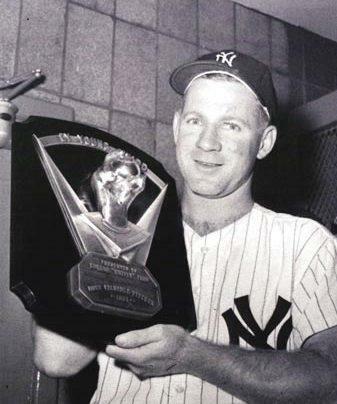 Acknowledged as one of the best pitchers ever the award given to the best left-handed pitcher in the big leagues is now called The Warren Spahn Award. 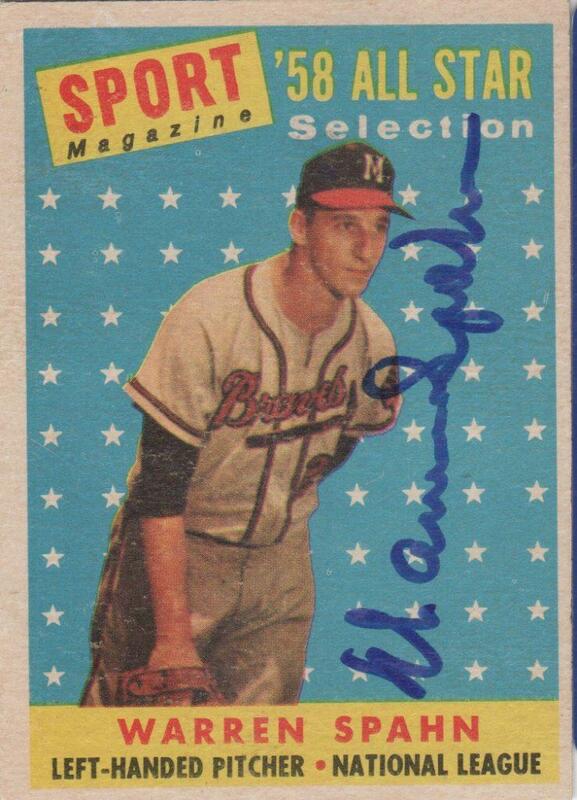 Shown here is an autographed 1958 Topps All Star card. 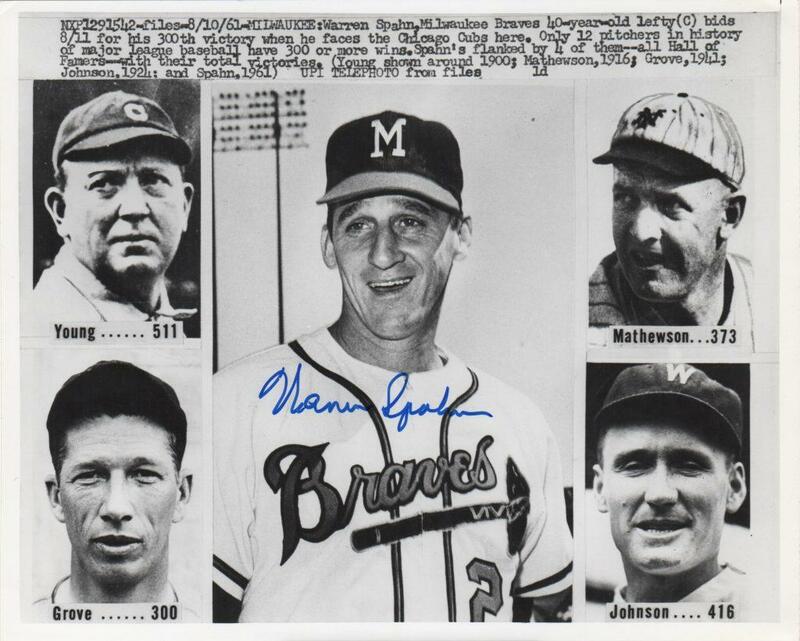 When Warren Spahn earned his 300th win on August 11, 1961 he joined an exclusive club. The lefty great went the distance that night — the 317th complete game of his career — and drove in the game’s first run with a sac fly. This photo shows fellow 300-game winners Cy Young, Grover Cleveland Alexander, Walter Johnson, and Lefty Grove. 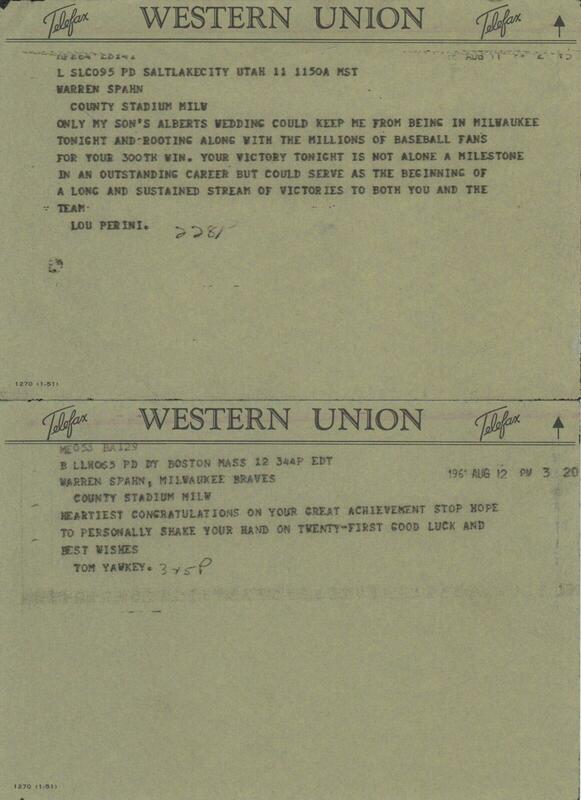 Be sure to scroll down to see congratulatory telegrams from Spahn’s estate. After Warren Spahn earned his 300th victory the congratulatory telegrams came rolling in. 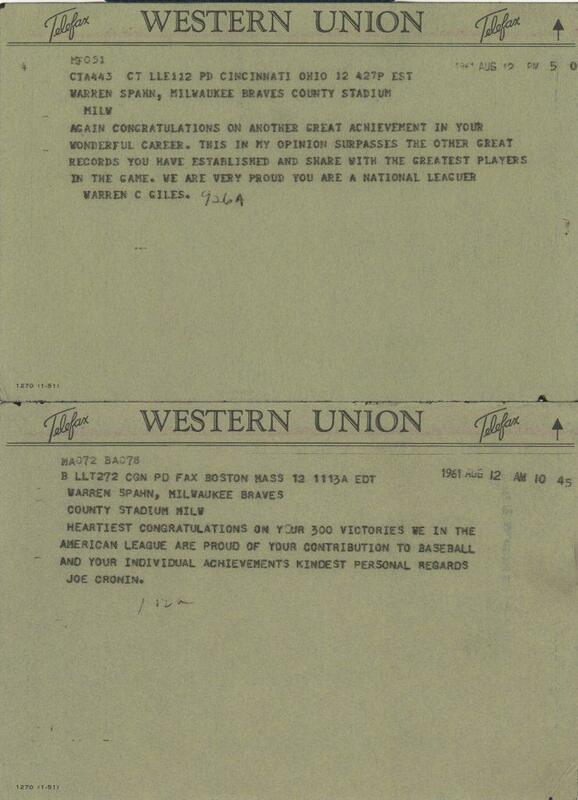 Shown here are two such telegrams that originate from the Warren Spahn estate. National League president Warren Giles chimes in saying, “Again congratulations on another great achievement in your wonderful career. This in my opinion surpasses the other great records you have established and share with the greatest players in the game. We are very proud you are a National Leaguer. Among the other telegrams that Warren Spahn received is this example from San Francisco Giants owner Horace Stoneham. “Warmest congratulations on your 300th victory. It rates as one of the All-Time pitching records though we both know you won more than half of them from the Giants. All the very best of luck on the next 300.” Spahn would conclude his stories career in 1964 pitching for Stoneham’s Giants. The Cincinnati general manager from 1951-1960, Gabe Paul saw Warren Spahn pitch against the Reds for ten years. 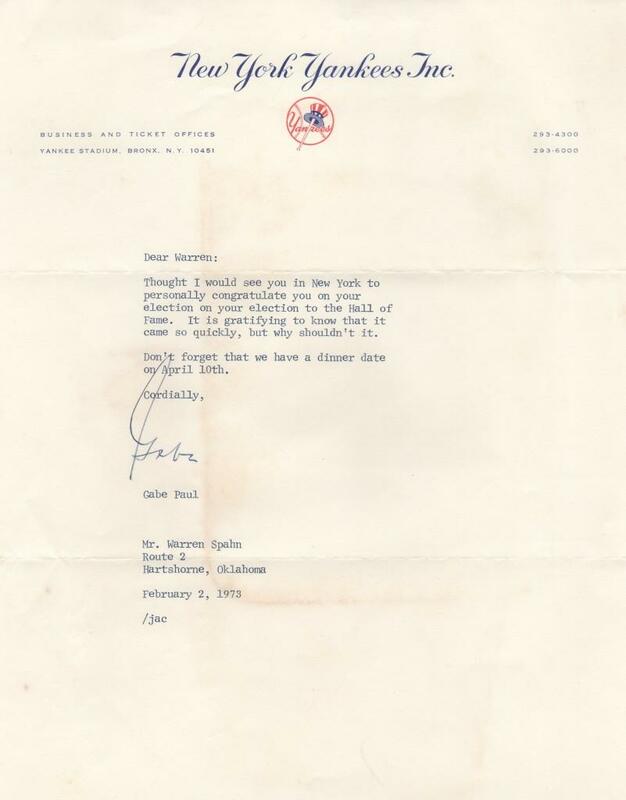 Shown here is a letter from Paul in his first year as Yankee GM in 1973. He writes to Spahn, “Thought I would see you in New York to personally congratulate you on your election to the Hall of Fame. It is gratifying to know that it came so quickly, but why shouldn’t it.” Paul closes the letter by signing with only his first name. 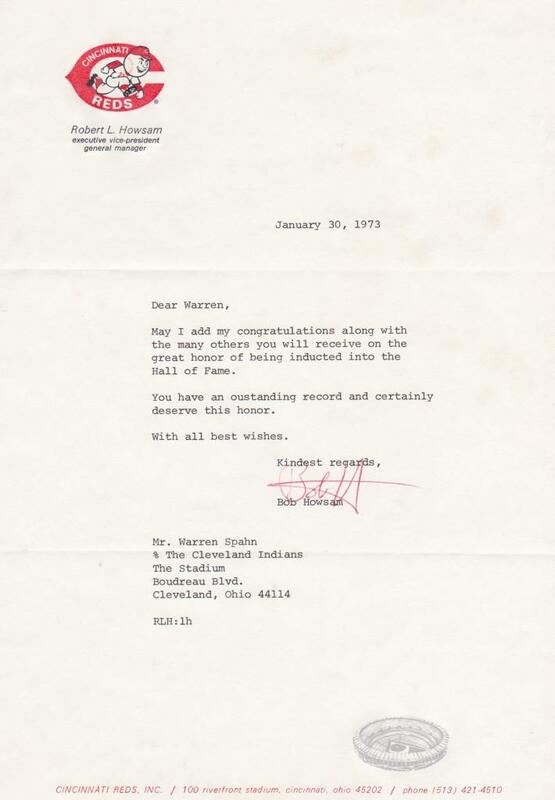 Bob Howsam writes to newly-elected Hall of Fame pitcher Warren Spahn on January 30, 1973. The executive vice president and general manager of the Reds writes, “Dear Warren, May I add my congratulations along the many others you will receive on the great honor of being inducted into the Hall of Fame. 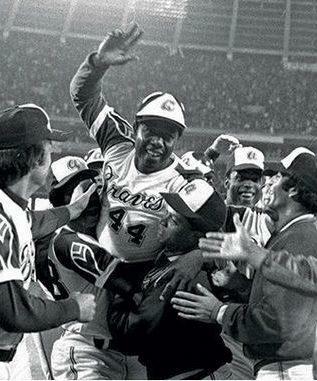 You have an outstanding record and certainly deserve this honor.” Howsam himself has appeared on Veterans Committee ballots and remains a viable Hall of Fame candidate. In the collection is Warren Spahn’s Major League Baseball Players Alumni Association membership identification card. Coming from the Spahn estate, this card was in Spahn’s possession until his death. 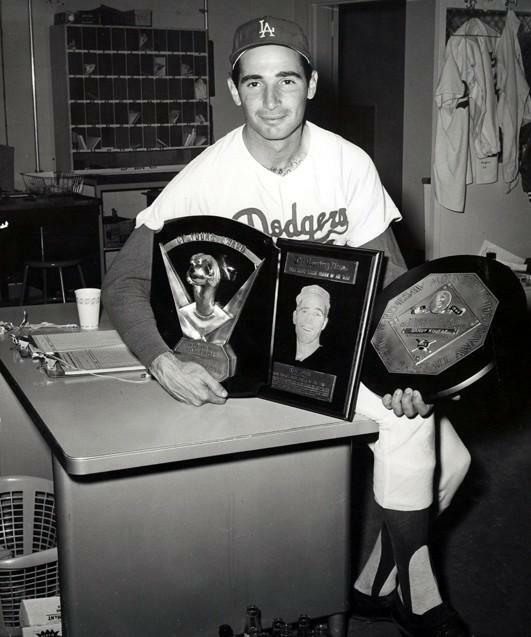 He had a tough time leaving the game, pitching one year in the Mexican League at age 45 before closing his playing career as pitcher/manager of the Tulsa Oilers in the Pacific Coast League the following season. 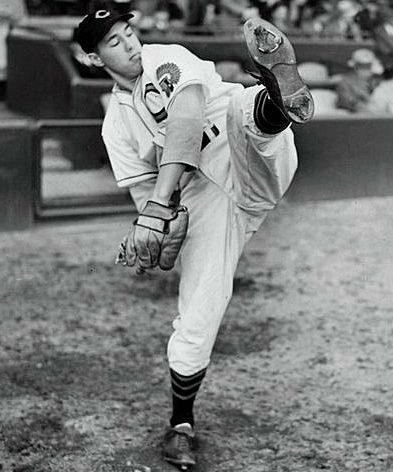 Later he served as coach with the Indians, the Angels organization, and Japan’s Hiroshima Toyo Carp. Active in the Major League Baseball Players Alumni Association, Spahn kept his membership up to date. Shown here is a personal check made out to the MLBPAA on October 20, 1994, 30 years after he played his last big league game. The check is for $30 and represents payment in full for the annual dues. 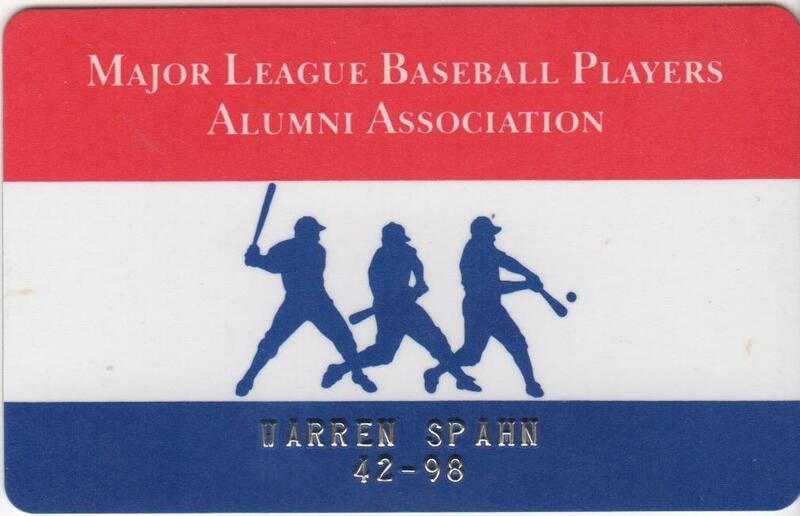 Active in the Major League Baseball Players Alumni Association, Spahn kept his membership up to date. Shown here is a personal check made out to the MLBPAA on October 20, 1994, 30 years after he played his last big league game. The check is for $30 and represents payment in full for the annual dues. Spahn has signed the check boldly at the signature line of the check.